Today, JKSSB had stunned everyone, by announcing back to back Notification regarding the Pending Exam Dates and Recruitment Notifications for over 3700 Posts. The First Notification is Advt No. 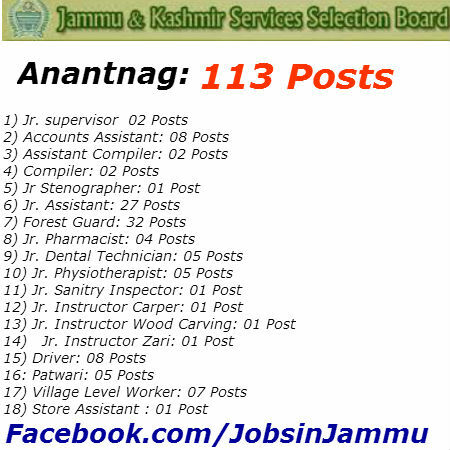 5 of 2015 for 1088 Posts and the 2nd Recruitment Notification is Advt No. 6 of 2015 for 2647 Posts. These Latest Recruitment Notifications come under the "J&K New Recruitment Policy-2015" Dated 30th June, 2015. Again, these applications process for these JKSSB Advt. is Online mode, The Online Registration, will start form 5th Sept, 2015 and Last Date to Submit the Online applications is 19th Sept, 2015. 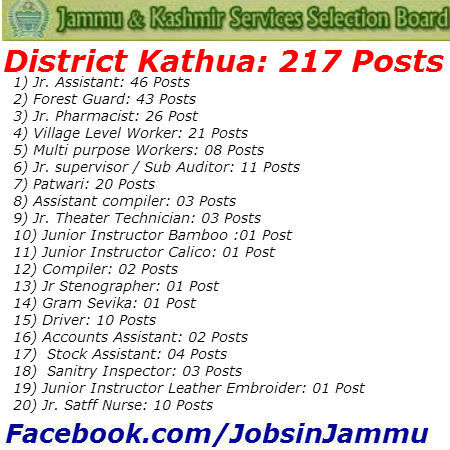 These vacancies are advertised for all the 20 Districts of Jammu and Kashmir Divisions. 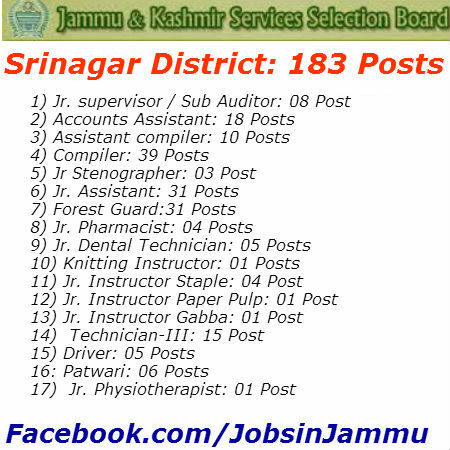 This Bumper JKSSB Sept Recruitment 2015 has Jobs for Everyone. So if you are Matric Pass, Intermediate (12th Class), Undergraduate, Graduate and Post-Graduate, there is Job for Everyone. 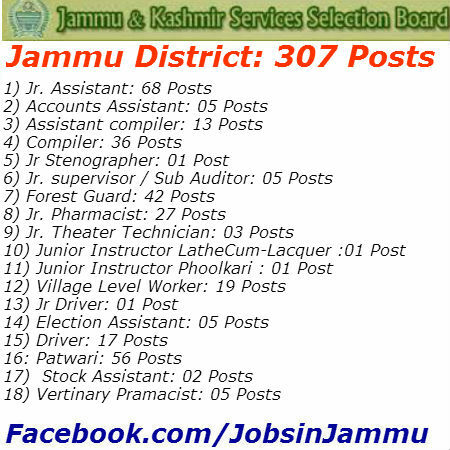 In this post, we will share the complete District wise List of Vacancies and District wise List of posts advertised under the JKSSB Advt. 06 of 2015. 2) Age-Limit: The minimum age specified for all the Posts is 18 years, while the maximum age is 40 years (For Gen Candiadtes). For other, there is age relaxation, as per state govt. rules. As we all know, that JKSSB application process is online, So applicants need to Submit their application through online mode only. The Detailed Instructions for Submitting the online application form are given in the Official JKSSB Advt. Online Application: The Starting Date for Submitting the Online application is 5th Sept, while the Last Date is 18th Sept, 2015. Applicants are advised to apply well in advance to avoid any last minute trouble. In our Upcoming post, we will share the Tutorial for the Submitting the JKSSB Online Application form. Application Fees: Applicants need to pay Rs 400 as application fee per post, in the form of a System Generated Challan form, in any J&K bank branch. The last date for depositing the fee is 19th Sept, 2015.